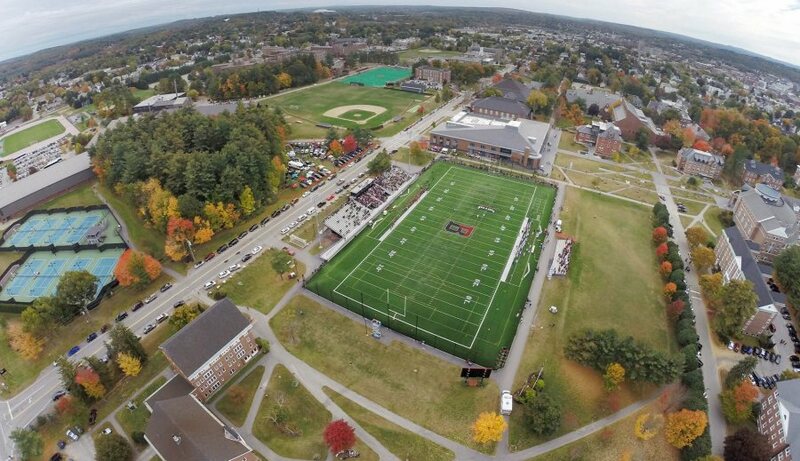 The $2.6 million donor-funded renovation to Garcelon Field in 2010 has led to a lot of good things for Bates over the last five years, including tonight’s first-round NCAA men’s lacrosse game between Bates and Keene State at 7 p.m. The 2010 renovation featured a new FieldTurf surface; an aluminum grandstand for 1,500 fans including stadium seats in the center section; a larger press box; and four Musco light towers for nighttime play. Today’s game is the first playoff contest ever played on the field since it was built in 1899 and named for a leading Lewiston and Maine citizen, Alonzo Garcelon. Bates football was Garcelon’s only tenant for much of its history, and like its NESCAC counterparts, football does not play in the post-season. But with the 2010 renovation, and the lacrosse program’s move to Garcelon Field, the door was open for the field’s debut tonight as an NCAA post-season venue. In that spirit, here are 11 ways that Garcelon is the Bates place to be. 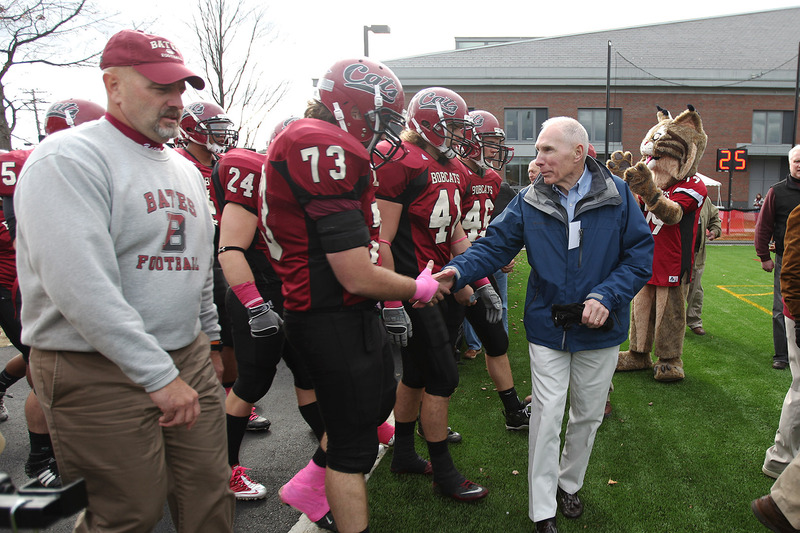 Made possible by Bates donors, dedication day in 2010 was a happy day that set the tone for an invigorated Bates place. The Class of 2012 used Garcelon Field to begin a new Commencement tradition. Rather than the Historic Quad for their class photo, they chose Garcelon. And for the first time, the class formed their class numerals, as shown in this time-lapse video by Josh Ajamu ’14. The official stat sheet says the Bates baseball team makes its outside debut in February, down South or out West. But it can “begin” much earlier, like January. 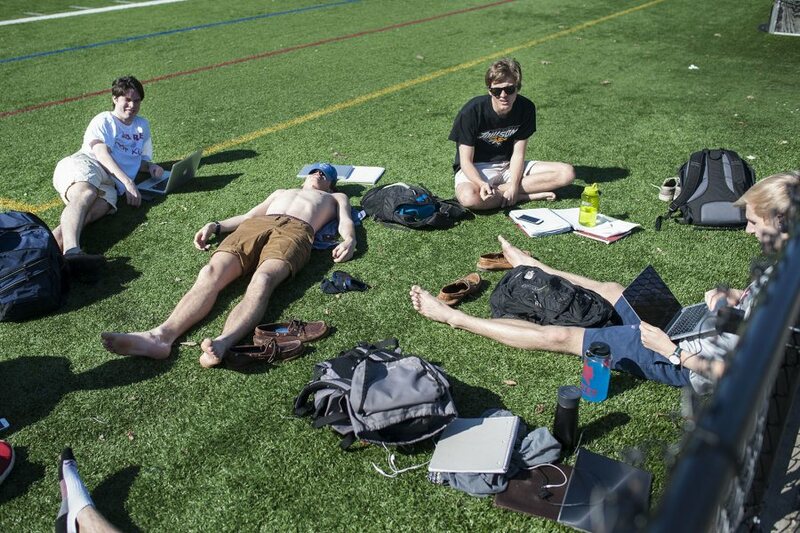 “It’s unbelievably warm,” said Sam Maliska ’15, a righthanded pitcher from Palo Alto, Calif., as he and others threw the ball around on a rare warm day in January 2014. “I love being out here with the boys,” said Maliska, standing third from left in the photo below. Last year’s January prelude culminated in the team’s first-ever appearance in the NESCAC Championships in May. This spring, the team has again made it to the NESCAC tournament. After Bates student John Durkin ’14 died while studying in Rome in February 2014, his family and friends established the John Nolen Durkin Fund at the college. 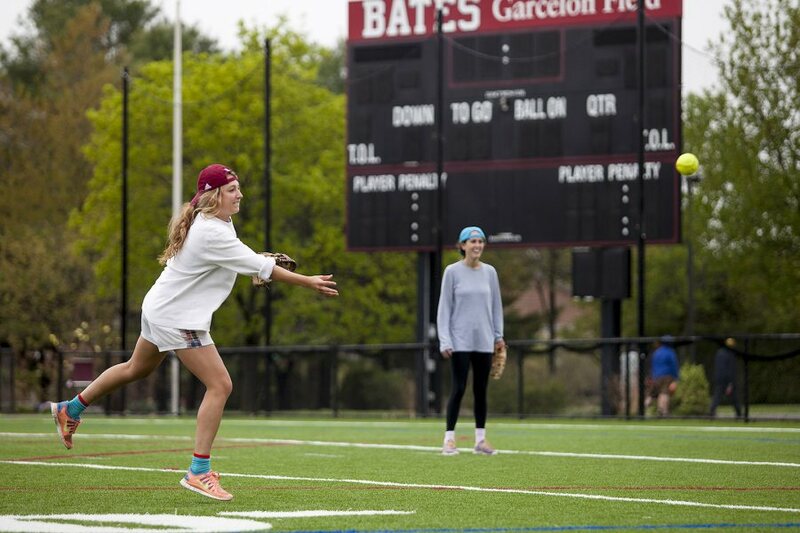 In May 2014, his Bates friends held a benefit softball game at Garcelon Field, raising more than $2,000 for the fund. The second annual fundraiser is scheduled for May 16. The renovation of Garcelon has coincided with an upswing in the football team’s success. 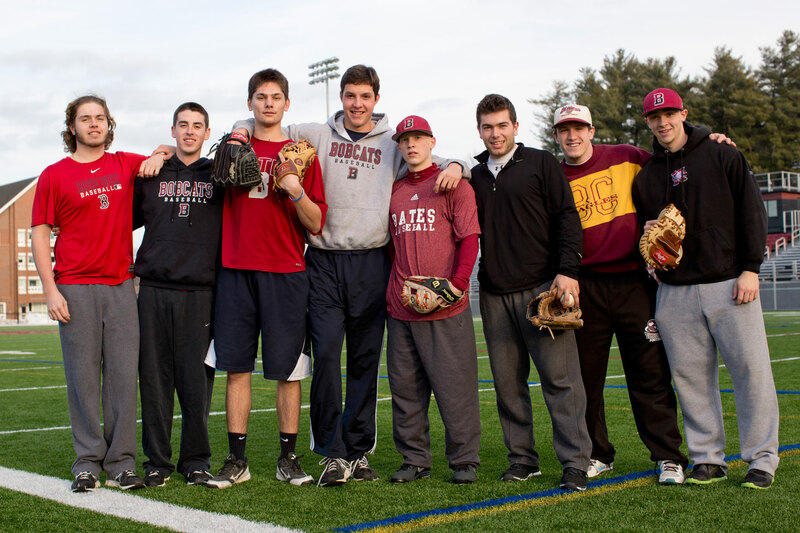 In 2014, the Bobcats concluded their best four-year stretch since 1982. And that’s something to shout about! Careful plowing by Bates Facility Services helps to keep Garcelon Field snow-free during the winter semester so anyone can relish a bit of green space and dry ground — even if the “green” is polyethylene fibers and the “ground” is silica sand and rounded bits of cryogenic rubber! 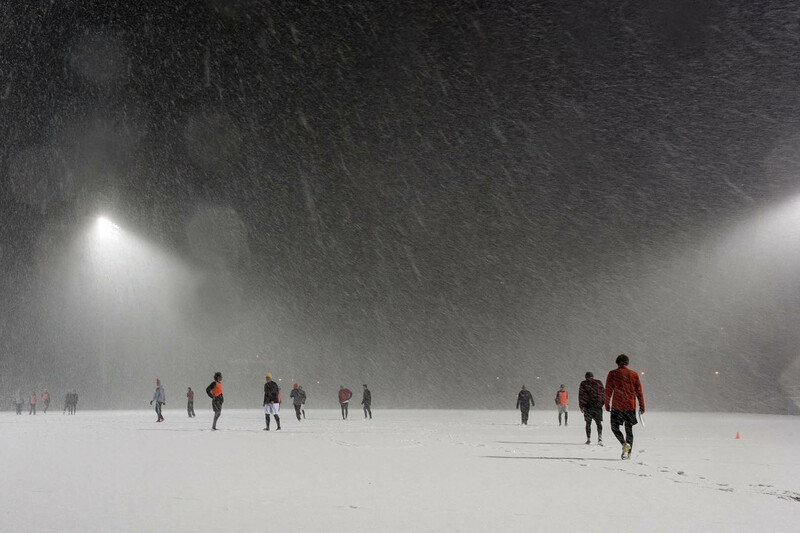 And even if there’s a bit of snow in the air, the games go on. 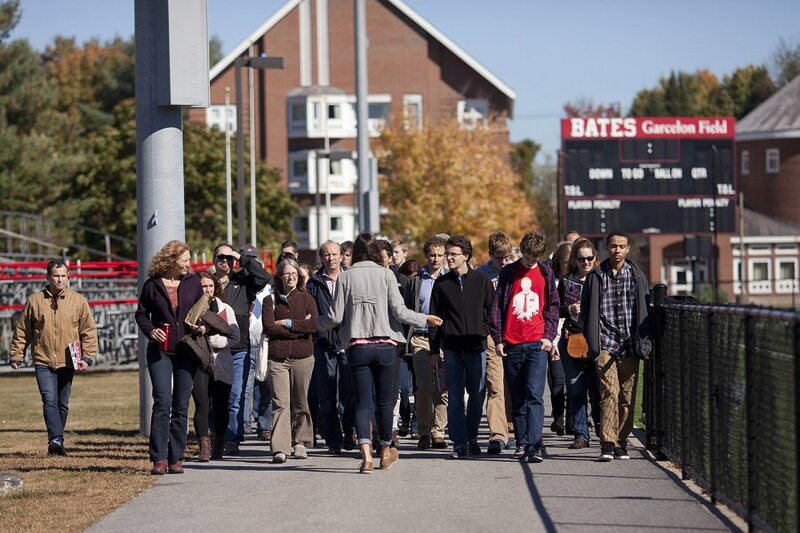 You have one chance to make a first impression — that could be a mantra of Admission tour guides, who know that a campus tour makes a powerful statement about a college’s attractiveness and value. No wonder that our tour guides lead their groups from the Residential Village to Commons by way of Garcelon Field. 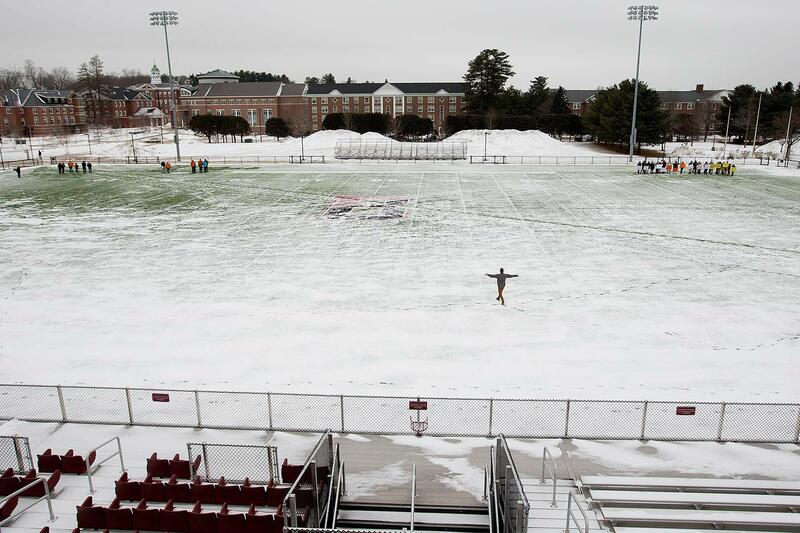 FieldTurf tends to absorb more solar radiation than grass, so Bates students know where to go for a cozy and warm microclimate on a spring day. Students of geology professor Mike Retelle took to Garcelon on a cold January 2014 morning to demonstrate visually how long it took for life to appear on Earth after the planet formed 4.6 billion years ago. The idea was to use the 100-yard length of Garcelon Field to create a geologic time line. At one end, a group of students represented the earliest geologic processes, some 3.93 billion years ago. Then there was a long gap, 70 yards or 3.3 billion years, to the next group of students way down by the other end zone. They represented the relatively recent appearance of life, 600 million years ago. At the 1 yard line, or 55 million years ago, a student represented the first primates. “It’s crazy to see. Everything happens inside the 15-yard line,” explained Luke Combs ’15, an economics major and football player. 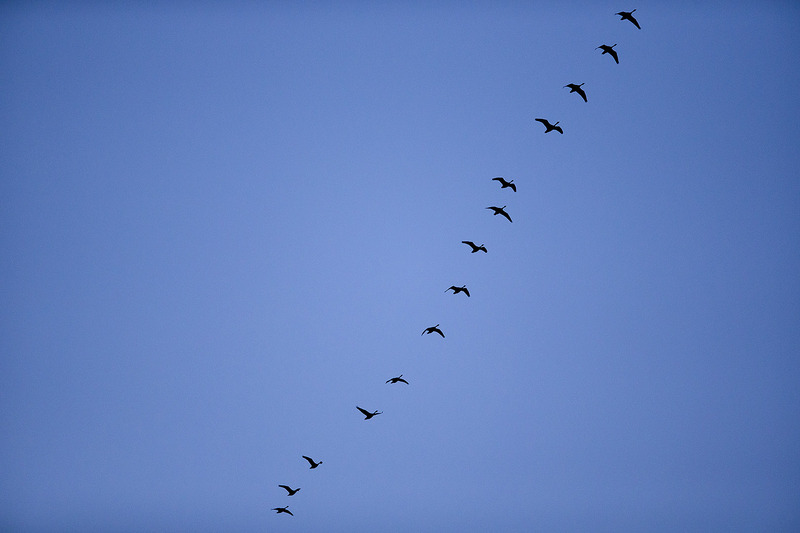 During a men’s lacrosse game vs. Bowdoin at Garcelon Field on April 2, 2014, fans who looked up from the action saw a line of Canada geese heading north for the summer.